How three centuries of lives connect to an English countryside home (1862 – 2017): Writing is “a lot like assembling a puzzle,” says Kate Morton, bestselling Australian author and Londoner. 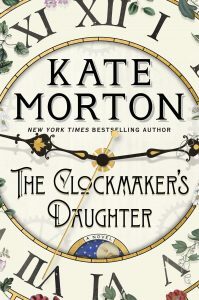 Yet after five hefty novels, she found crafting her sixth, The Clockmaker’s Daughter, “the hardest novel to write because it has so many strands.” Now she challenges us to figure out how all the character-driven storylines are connected over 150 years, over nearly 500 pages. Not so easy as you can get lost in her gorgeously flowing prose, richly atmospheric with historical threads. As the title suggests, this puzzle is Time-themed. Packaged in a thousand-piece, high-quality box, the cover image is a “lichen-colored stone” English country estate surrounded by lush gardens, matching stone walls, and beautiful views. The stone – ancient Cotswold Stone – is key to the location: someplace around Gloucestershire and Oxfordshire counties outside of London. A step-back-in-time designated Area of Outstanding Natural Beauty, ideal for puzzling with 21st and 20th century pieces that link to the 19th. Many characters serve to entangle generations to each other, to drive home a message of timelessness. How they link up, mysteries, are the puzzle pieces we’re enticed to put together. This ghost is so secretive no one knows her real name. We get to identify her by a fake one, Lily Millington, adopted in the heat of the moment when she meets Edward Radcliffe, a charismatic artist and member of the Magenta Brotherhood. Fictionalized, it appears, to contrast with the real short-lived yet influential Pre-Raphaelite Brotherhood from the Victorian era, which is also cited. Edward’s character meshes with his fellow artists known for: “sensuality and motion. They obsessed over things like enchantment, memory and truth; nature and the meaning of beauty.” So it’s entirely within his passionate nature to intensely, instinctively feel Lily will be “his muse, his destiny” despite his engagement to a high-society woman. Very different from Lily, whose grim and grimy backstory doesn’t equate with a genuine love with someone like Edward, except to escape a harsh life. But that love does endure the test of time, and place. Initially, Edward paints his stunning model in the studio garden of his mother’s London home. Not enough “heaven-scent” light, so he beckons her to the beauty and privacy of the heavenly countryside of Birchwood Manor, along with his band of artist friends for what turns out to be a life-changing summer. Lily tantalizes, whispering there’s another reason Edward’s drawn to the estate but it’s “a secret.” Fast-moving events happen in the opening pages – the death of Edward’s fiancé and a jewel theft – but Edward’s secret takes time to surface. The paradox of time: some things move so swiftly they pass us by; others dwell like a broken clock. Memories forgotten; memories everlasting. Lily and Edward exemplify both. They leap forth, but before we know it they’ve mysteriously disappeared. Edward only reappears in memories the ghost wants to reveal when she chooses to. Periodically she does, poking back into the novel eleven times, after initially appearing in a preface, moving back and forth through time and storylines, taking us right into the present-day, 2017. That’s when Chapter One begins, introducing Elodie Winslow, a thirty-year-old archivist working for the venerable London firm Stratton, Cadwell and Co. A quiet, thoughtful person, well-matched to archival work, especially investigating the provenance of artifacts – piecing together the past – since it’s twenty-five years since she lost her famous classical cellist mother and has yet to know facts leading to her untimely death. She still misses her terribly, as does her melancholy father, but she’s been overly sensitive to ask him any questions. Elodie’s story opens when she discovers a box under her desk. Among the contents are a fine leather satchel with sketchbooks inside, and another leather case coveting a lovely framed picture of an arresting woman dressed in white. She judges these items Victorian-aged. Something about the sketches triggers a primal reaction, echoing a fairytale her mother used to tell her. The reader has scant information to go on, but Elodie’s remembrance of a river sticks with us too because on page five our ghost mentions a riverbank. Was the fable imagined or based on reality? How did these artifacts end up at Stratton, who was a Victorian? Sketches of the house also feel strangely familiar, conjuring the safety and love a mother’s bedtime story can mean to a little girl who came to call it “her secret place.” Faced with a personal need to investigate the past, these historical finds consume her, overshadowing upcoming plans for her wedding in six weeks. Future mother-in-law, Penelope, overbearing and controlling, is not pleased with how little attention Elodie is paying to the wedding arrangements, constantly calling and interfering, whereas husband-to-be, Alastair, an investment banker on business in New York, is noticeably absent. Mother-and-son suggest a haughty upper-class, unlike down-to-earth, very likable Elodie. We never even meet Alastair, except through Elodie and conversations with her best friend, Pippa. Pippa is an artist. Art – its beauty and permanency – an ever-present connecting theme. While the reader wishes Elodie stays around longer than she does, Morton has other goals in mind: other characters with their own stories of loss to heighten how much the past and present converge. They include: The Special Ones from the ghost’s past; Elodie’s peculiar great-uncle Tip who reacts though denies that he recognizes the Victorian photo of the woman dressed in white; Edward’s devoted sister Lucy who turns the house into a proper boarding school for girls, some with their own abandoned stories; others who stay on the estate during later transformations. After the school closed, the ghost roamed the vacant property. Then the Society of Art Historians bought it, turned in into an artist’s museum. That’s when Leonard arrives to research the mystique of Edward and the house for his doctoral thesis; he also bears a loss from the Great War. Later, a private investigator arrives photographing and searching for something. More: Juliet, a young widow who fled to the house with her three children when London was evacuated during the second war. Memories, stories that span two World Wars. The ghost watches over all the “visitors,” illuminating what they’re doing at Birchwood Manor: “I have come to understand that loss leaves a hole in the person and that holes like to be filled.” She helps fill these in for us. When Elodie returns to link the remaining puzzle pieces, we have a light bulb moment and our own sense of contentment. Thanks for writing. Pleased the review will be helpful. It even takes a while to figure out the title. Note writing it was challenging for gifted Morton. Plenty for your book club to discuss.